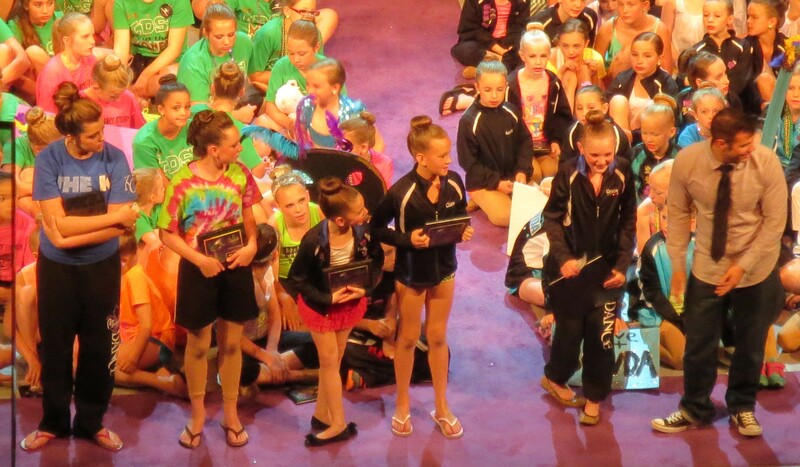 This past week, Lake Area Dance (LADC) participated in the Masquerade National Dance Championship in Burnsville, MN. It started on Monday with several Intermediate level solos. 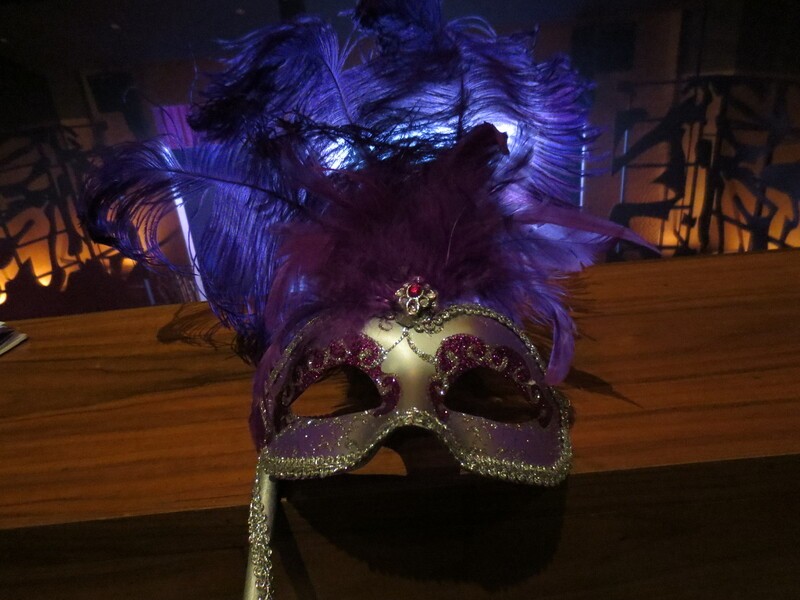 That night, after the awards ceremony, Masquerade had a Welcome Party for participants. They had pizza and a karaoke DJ. Last year, we missed the party, and the pictures looked like they had so much fun. This year, we were definitely NOT going to miss the welcome party! On Tuesday, they offered Master Classes. Last year, Grace got to participate, and really enjoyed them. She wanted to do them again this year, but injured her pinky toe the week before Nationals. She was afraid it would be too hard to dance later in the week (when she was competing) if she danced on it at the intense level of the Master Classes. Several dancers in her group did take the classes, and really enjoyed them. 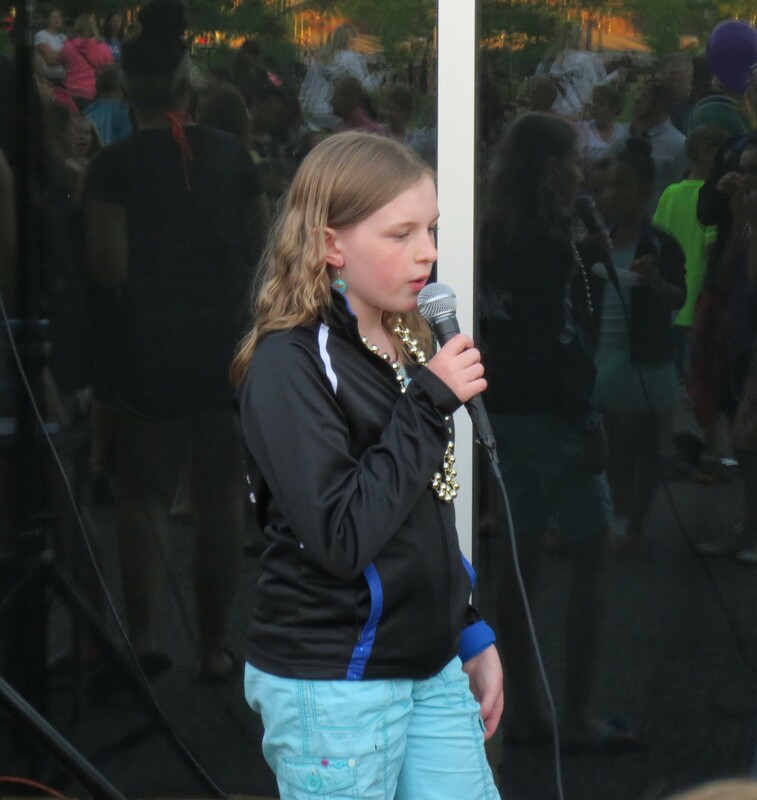 On Friday, Grace’s group (the Angels) was scheduled to compete. We got up early, headed out to Burnsville, and got there with plenty of time to spare. Once Grace was set up in the dressing room, and completely ready for her first dance – tap, I went to the auditorium to watch all the great dances. What a day! The dances were all incredible! Michael came with, and played his ipod with some of the other dance brothers. The Angels were on fire that day! They nailed their tap dance. They had lots of energy, and their feet and arms were very together. The judges seemed to agree, since they were one of only about a dozen groups (out of about 50) who got a platinum rating that morning. 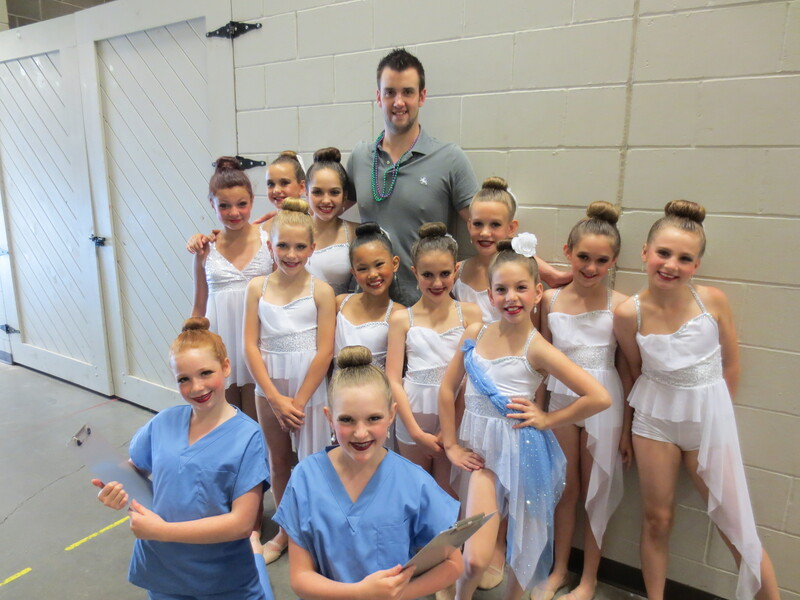 The Lake Area Dance Center Angels with their choreographer/teacher, Mike Dietz. They had a bit of a wait before their second dance of the day – lyrical. I’m not sure what was in all their lunches, but they were crazy before they went out and danced! Since I have to help Grace with a costume change backstage during that dance, I was back with them for quite a while. I don’t know that I’ve ever seen them all so silly, but I’m thinking their teachers must have a lot of fun with them some days. They were very entertaining, to say the least. Since I’m usually backstage during this dance, Tears of an Angel, I don’t usually get to see the whole thing. Masquerade has monitors back stage showing the dances, so this time, I watched it with all the other dancers/teachers that were back stage. It really is a beautiful dance, and so sad! Not sure if I’ve told the story line yet, but in short, it’s a girl who’s parents are in the hospital dying after an accident. The other girls are the angels around her… The girls did an amazing job. All the dancers backstage had nothing but wonderful things to say about it! 🙂 They were given a platinum score for their dance by the judges. In my opinion, it was equally as good as their tap dance. Sing, Sing, Sing – South Metro Dance Academy (my friend’s daughter was in this dance, and was called back for a Teen Encore Performance in the finals. This dance was very together, and very well danced). 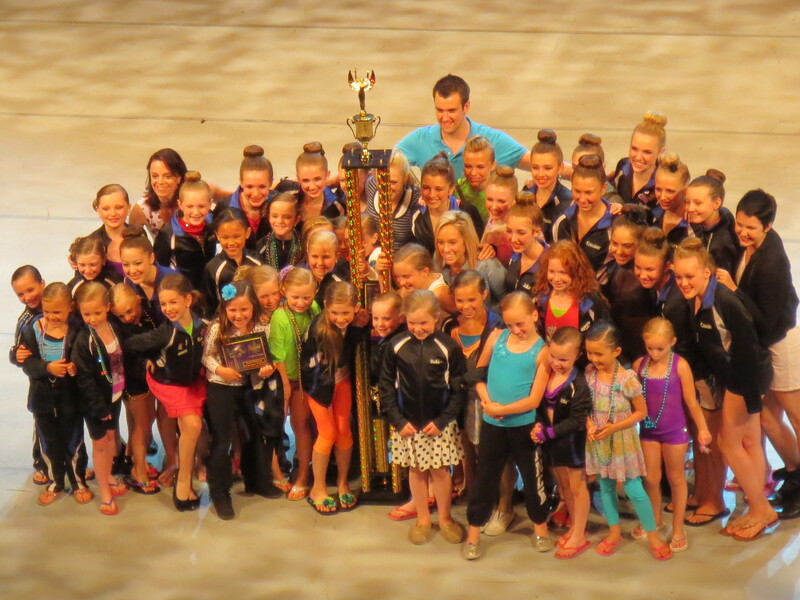 We were very proud of all the dancers, and that their hard work paid off! We were a bit confused (and a bit bummed), that the Angels were the only group from our studio that was not called back to Finals at all. Even after sweeping their division, they did not get called back for intermediate division, junior division, or for an encore. I tried to cheer Grace up by reminding her they took 1st, 2nd and 3rd in the Junior Intermediate Division, and that they were still champions. Unfortunately, it didn’t remove the disappointment she felt. Miss Maria assured all of us (via an email she sent that night) that Finals or no, the Angels’ results played an important part in the studio’s overall success, and that she was very proud of everyone’s hard work. When I read it to Grace, she felt a little better about the whole thing. Saturday was Finals. Even though Grace wasn’t dancing, we went to cheer on our teammates. Also, last year, we missed the announcement that Lake Area Dance was Intermediate Studio of the year. She did NOT want to miss that if that were the case again this year. When we first got there, Grace was still feeling bummed out, but was looking forward to what she knew would be an afternoon full of amazing dances. We were really excited about watching the Opening Number, also known as the Parade of Stars. Three Lake Area Dancers were included in this dance. It was SO good!!! We had expectations of an amazing show, and it did not disappoint. Besides the amazing dances, highlights included the Sparkles (8-10 year olds) WINNING the Petite Encore Award; the Dreamlites (our teen group) WINNING the National Champion Large Group Dance Off, and a choreography award for the Hunger Games (way to go Mike Dietz); and Lake Area Dance being named Intermediate Studio of the Year. I don’t think there are words to describe the excitement over that title!! We are so proud to be part of such a great studio!